Cline Services Offers Mattress Cleaning! In addition to offering carpet and rug cleaning to Charlotte and vicinity customers and commercial enterprises, Cline Services also cleans upholstery. If you think about it, mattresses could could count as upholstery, too! So…Cline Services cleans mattresses! If you have allergies, you probably want to keep your mattress as free as possible from dust mites. Having your mattress professionally cleaned will get rid of those nasty buggers and you will most likely sleep a lot sounder. Professionally cleaned mattresses will also cut down on dust, dirt and other particles which could aggravate your symptoms. Do you have indoor pets? Pet dander gets into everything! If your precious darling likes to sleep on your bed, you can rest assured that pet hair is going to find its way to your mattress, despite any covers you may have put on it for protection! It's as if pet hair has four legs of its own. Darn stuff can find its way into just about anything, as any pet owner will attest. We all love our animals, and they are part of the family too, so some things you learn to tolerate. However, you can be proactive and have your mattresses cleaned on a regular basis. Works wonders! Speaking of those we love, if you have small children, then you know accidents happen. 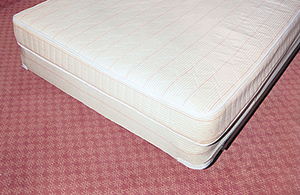 Although mattress protectors can solve the problem of a bed-wetting child soiling a mattress, sometimes older kids have accidents, too. Once again, if you have pets and a child wets a bed, guess what Rover and Fluffy are going to think is OK to do? A mattress can get stained badly if you aren’t getting it cleaned. And mattresses aren’t cheap, either! Let Cline Services help you get your money’s worth from that investment! So, the next time you’re getting your carpets steam cleaned, why not get your upholstery—including mattresses—cleaned, too? Cline Services can offer you one complete deal. No coupon hoops to jump through, no foot-in-the-door pricing, no arm-twisting sales tactics because a quota hasn’t been met. Just an honest, owner-operated business trying to do what’s best for you and your circumstances. Remember, Chip has been in this area all his life so you will know where to find him. He’s going to treat you right. Want to stay in touch with Chip at Cline Services, LLC Carpet Cleaning? Then “like” the Cline Services Facebook page! Keep up with all things carpet and maybe even learn of special deals before anyone else! You can follow Cline Services on Twitter, too! Chip was able to get out stains that other cleaners were not. He is always reliable and professional. I recommend his services to anybody in need of a carpet cleaner.